*Sarah is wearing a Waltham watch and according to the serial number it was likely made in 1873 and is most probably Elmira's watch. Sarah's daughter Lena Violet always had it in her china cupboard and it is still with her family. Front row L to R is Great-Grandmother Britt; Mother May (William) Conn, and Great-Grandmother Elmira (Reichert) Knoll. Back Row L to R is Grandmother Mary (Britt) Conn, Ruby Conn, and Grandmother Sarah (Knoll) William from the MLH family photo album. 41. Albert and Sarah (Knoll) William with siblings at their 50th wedding anniversary, photo taken on 10 Aug 1940. Standing: Wilson Knoll, Earl William, Harry Knoll, Alice (Knoll) Swank, Katie (Knoll) Swank, and William Knoll. 5. Mayflower Church from the pasture of A A and Sarah (Knoll) William's "Oak Grove Stock Farm"
Postcards Collection 6: Postcard from Oscar Knoll, Sarah (Knoll) William’s brother. Albert William, Fred Wehousen, friend & neighbor, Jennie Conn and behind, Sarah William (dau), George and Sadie William, (behind Sadie is:) Mae Conn, Wilse Knoll, and Bina Conn, Ralph (MR) Conn, Elmira Reichert Knoll, Sarah Knoll William, Ruby Conn, Lena William, Minnie William, and Arthur Conn.
4. Mayflower Church Adult Sunday School Bible Class certificate, organized 6 June 1910. Letter written by Minnie Irene (William) Smith regarding "Fried Cake Day", a family tradition and additional comments provided from Lena (William) Roach family. Letter written in the 2000's. [S247] findagrave, www.findagrave.com, Find A Grave Memorial# 35800994. 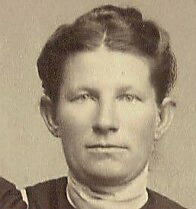 Sarah Ann Knoll was born in Upper Tulpehocken, Berks County, Pennsylvania, on March 23, 1867. She was the second-oldest of sixteen children; her brother, however, died when he was just six months old. Sarah's parents were: George K Knoll and Elmira Reichert. Sarah Ann moved to Osborne County when Albert William was nine years old and both attended the Mayflower School District #66. The William's and Knolls were neighbors and both families attended the same church. Growing up together to young adulthood, Albert and Sarah were married on August 10, 1890. They moved to a farm in Section 29, Lawrence Township, near both of their parents' homes. Their farm was called: "Oak Grove Stock Farm". Mr. William was a farmer and a stockman there for the rest of his life. Albert and Sarah knew many hardships in their lives, especially in childhood after their families moved to Kansas. Their married life together was not carefree--they too know more hardships--yet they did not have to re-endure the extremes of their childhoods. They owned a moderately prospers farm and were well-known and respected citizens of the Osborne Community. Until the mid-1900's the infant mortality rate has characteristically been high. Sarah's mother lost three of sixteen children, and unfortunately, Sarah experienced an ever higher loss. She gave birth to thirteen children, but only eight survived early childhood: four died within the day of their births, and one baby boy died when he was but nine months old. The actual cause of death of the children is unknown. All of the surviving children attended the Mayflower school and the family were charter members of the Mayflower United Brethren Church which Albert and Sarah's fathers built in 1905. [S330] Website Member, e-mail/Proposed Change: Sarah Knoll , 26 Jul 2015.